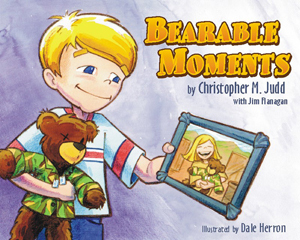 Bearable Moments is a timely yet timeless story of a boy named Blake whose mother gets deployed as a member of the United States military. Blake finds himself lonely and missing his mother until his mother's childhood teddy bear lifts his spirits. Bearable Moments received Honorable Mention in the 14th Annual Writer's Digest International Self-Published Book Awards. (NMFA.) NMFA helps prepare spouses and children of American troops, including those who have been deployed, wounded or fallen in action, to deal with the challenges unique to military life. NMFA provides such initiatives as free camps and after-school programs that provide coping skills for children of deployed service members, spouse scholarships, and funds to help support various military community programs.